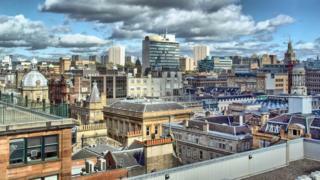 Glasgow is one of the most polluted parts of the UK, an air quality report has shown. The World Health Organization (WHO) said it had tested 51 towns and cities for fine sooty particles linked to heart disease and premature death. Glasgow had 16 micrograms of the particles per cubic metre of air, exceeding the 10 micrograms safe limit. London and Leeds both had 15 micrograms of the particles in every cubic metre of air. Cardiff and Birmingham had 14 micrograms, and Manchester had 13. In total, 44 towns and cities across the UK failed the WHO's air quality test. The organisation was measuring particles that were smaller than 2.5 microns across - known as PM2.5s. Outdoor air pollution is estimated to cause 40,000 premature deaths a year in the UK and cost the country £22.6bn. Dr Toby Hillman, one of the report's authors from the Royal College of Physicians, said: "There isn't a safe limit for the amount of pollution that's been defined as yet and we know the effects of poor air quality run from cradle to grave. It's a lifetime threat to human health. However, they said the WHO limits represented a "safer threshold". Diesel-powered vehicles, which generate pollution particles, were one of the "key drivers" of poor air quality, Dr Hillman said. The Scottish government said Scotland was the first country in Europe to pass legislation based on WHO guidelines on safe levels of PM2.5s. A spokesman added: "We recognise the link between air quality and public health, which is why we announced earlier this month that Glasgow will be the first city in Scotland to introduce a low emission zone by 2018. "We are also working with local authorities to introduce low emission zones in each of our four biggest cities by 2020, and in all other air quality management areas where necessary by 2023." In September, the Scottish government announced a target to phase out petrol and diesel vehicles in Scotland by 2032. Are we doing enough to cut pollution?